WHILE the right wing of the Allied force in Papua was carrying out the Buna operation, the left wing was attacking Japanese positions defending Sanananda, a few miles west of the Girua River. From these two bases the enemy had started his advance against Port Moresby along trails which converged at Soputa. The Allied counteroffensive was compelled by lack of good lateral communications in the waterlogged coastal plain to follow these same trails and was consequently split into two separate and parallel operations. The bulk of the troops employed against Buna were American; the majority of those in the Sanananda zone were Australian, but American troops played a part out of proportion to their relatively small numbers. From the start of the operation, elements of the U. S. 126th Infantry were attached to the Australian 7th Division, which was under Maj. Gen. George A. Vasey, Allied Commander on this front. At the end of December the 163d Infantry of the U. S. 41st Division began to arrive from Port Moresby. 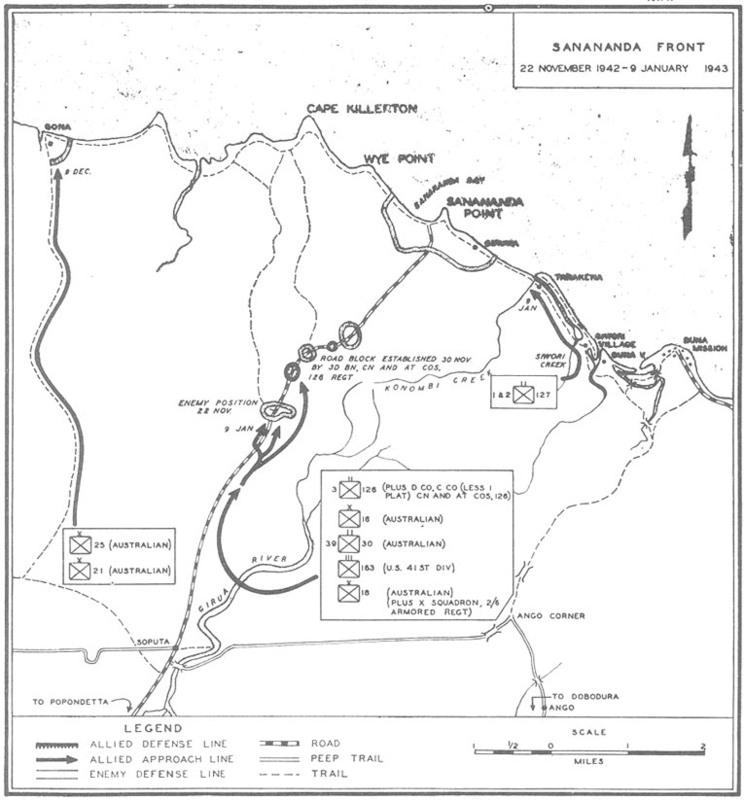 After the fall of Buna, units of the U. S. 127th Infantry moved up the coast to the Sanananda front, while the tanks and the Australian 18th Infantry Brigade came by way of Ango Corner. The present account sketches only those general outlines of the Sanananda operation which are required for an understanding of American participation. the one good line of approach, and its base was anchored on strongpoints covering the coastal trail between Cape Killerton to the west and Tarakena to the east. Gona was a flank position to the northwest of the main stronghold and could be reached from Soputa by a trail west of the road. A group of mutually supporting positions at the apex on the Soputa-Sanananda Road covered the Junction with the road of a branch trail to Cape Killerton. A half mile to the north was another group of positions where a second trail branched off toward Cape Killerton, and a half mile still further north was a third group of positions. 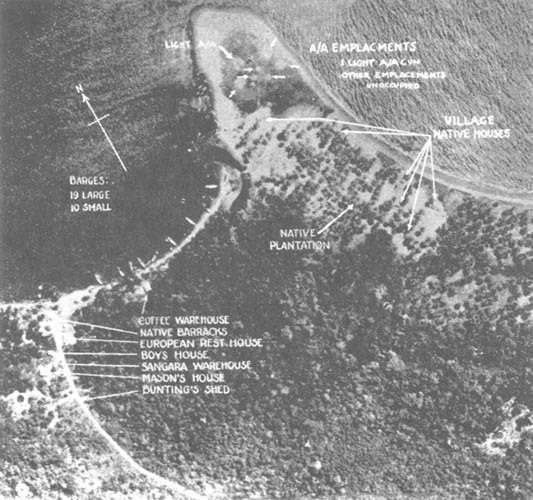 Each defensive position consisted of a single ring of bunkers similar to those found at Buna, connected by fire and communication trenches and thus constituting a perimeter. Many of these perimeters were flanked by swamps and all were well concealed in the dense jungle. Within the fortified area were concentrated some 3,000 survivors of the unsuccessful attack on Port Moresby, together with reinforcements which arrived by sea. Two of these units which had been decimated in the retreat across the Owen Stanley Mountains could be identified only tentatively: the Kusonose Butai and the Yokoyama Engineers. A third was definitely established as the Yasawa Butai. It consisted of 3 battalions of the 41st Infantry; the 1st Battalion was stationed at Gona, while the 2d and 3d were on the Soputa-Sanananda Road near its junction with the Killerton trail. On 20 November about half of the enemy troops were in positions along the road north of Soputa while the rest were on the coast. Reinforcements arrived during the first 2 weeks of December. A detachment of the Yamagata Brigade, numbering less than 1,000 and consisting of the Brigade Headquarters, the 3d Battalion of the 170th Infantry, and i battery of mountain artillery, landed north of Gona during the night of 1-2 December. A second detachment of the same brigade, also less than 1,000 in number, landed near the mouth of the Mambare River on the night of 12-13 December. The total enemy strength in the Sanananda area was therefore between four and five thousand, at least twice the strength of the Buna garrison. the strong defensive position of the enemy. 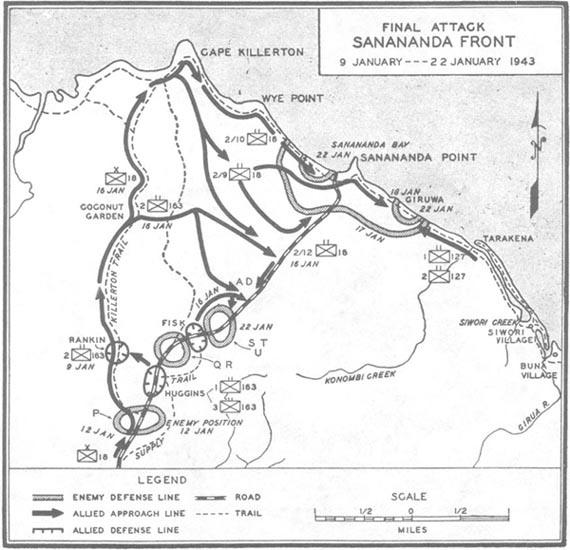 Even after reinforcement by fresh Australian and American units, the attack was stalemated until the fall of Buna permitted the transfer of further Allied forces to the Sanananda front early in January. Thereafter the attack was pressed with unremitting intensity until the last Japanese pocket fell on 22 January 1943. As the 16th Brigade of the Australian 6th Division and 25th Brigade of the Australian 7th Division came down to the southeastern coastal plain of New Guinea, they could look back on a series of uninterrupted victories since pushing the enemy out of Ioribaiwa on 28 September. Kokoda had fallen on 3 November; after a stand in front of Oivi, the Japanese had retreated without offering further battle. The Australians had pushed on toward the sea. On 19 November they made contact in Popondetta with an American patrol from the 126th Infantry, and patrols of the 25th Brigade entered Gona. These patrols were forced out of Gona by a Japanese counterattack before the main body of the brigade could come up. On the same day the U. S. 126th Infantry under Col. Clarence M. Tomlinson was attached to the 7th Division to operate west of the Girua River. The 2d Battalion reverted to the control of the 32d Division on 22 November and fought with the Urbana Force, but the 3d Battalion and part of the 1st Battalion (C Company less one platoon, and all of D Company) remained on the Sanananda front until 9 January. The Cannon and Antitank Companies of the regiment, which had been in the vicinity of Juare, joined the Sanananda forces on 29 November. managed to work part way around the enemy left flank, east of the road. During the next week they continued this envelopment, and the Cannon and Antitank Companies joined them. On 30 November, I Company under Capt. John D. Shirley and the Antitank Company under Capt. Meredith M. Huggins pressed on until they were astride the Soputa road in the rear of the enemy forward position, which was at the junction with the first branch trail to Cape Killerton. men could grab them by the ankles and pull them in, but they never broke through the block. Though K Company and the Cannon Company remained on the east flank through most of the period in order to maintain the supply line to the road block, it was often impossible to push supplies and ammunition through. Communications also were frequently interrupted. Day after day the dwindling survivors holding the road block had to spend all their daylight hours crouched in fox holes. Capt. Shirley was killed on 2 December. Capt. Huggins was wounded on the 5th but could not be evacuated until the 8th, when Lt. Peter L. Dal Ponte took command. Against these odds, I Company and the Antitank Company held on until 22 December, when they were relieved by the Australian 39th Infantry Battalion (30th Brigade). They then joined other elements of the 126th Infantry on the main Sanananda front, south of the road block. Exhausted by the long period under constant fire, these units of the 126th Infantry were finally withdrawn on 9 January and rejoined the remainder of the regiment at Buna. While the 126th Infantry had been holding the road block, the Australian 21st Infantry Brigade had come by air to Popondetta and reinforced the 25th Brigade on 28 November for a drive on Gona. They smashed through the desperate defense and captured Gona on 9 December. The Australians found that the last survivors of the enemy had fought with the dead bodies of their comrades decomposing about them. They buried 638 Japanese dead. Fresh American troops also were arriving from Port Moresby. The 163d Infantry of the U. S. 41st Division under Col. (later Brig. Gen.) Jens A. Doe began to move by air to Popondetta and Dobodura on 30 December. The regiment was attached to the Australian 7th Division and assigned to the road-block positions. The 1st Battalion marched via Soputa to take over the positions of the Australian 39th Infantry Battalion from 2-4 January. western flank of the Buna front, had established an outpost in Tarakena Village, but on 4 January a Japanese attack drove it out. Next day the 1st and 2d Battalions counterattacked from Siwori Village. E Company, in the lead, advanced along a sandspit which lay just off the shore and directed enfilading canister fire from a 37-mm gun against the enemy on the mainland, who were slowly pushed westward through dense jungle by C and G Companies. These companies recaptured Tarakena on the 8th, and on the following day reached the bank of the rain-swollen Konombi Creek. Meanwhile, X Squadron, Australian2/6 Armored Regiment, and the 18th Brigade were moving from Buna to the Sanananda front via Ango Corner. The 18th Brigade relieved the 30th Brigade and the units of the 126th Infantry on 9 January in the front line on the Soputa road. The Japanese at Sanananda could feel the net closing around them. With additional forces on hand, we could at last hope to break the long stalemate and sweep the enemy out of the Buna-Sanananda area. The Japanese position "P" at the Junction of the trail to Cape Killerton with the Soputa-Sanananda Road had thus far held up our advance, but our maintenance of a road block to the north forced the enemy to rely on the roundabout and difficult Killerton trail for supply of his front. The whole situation along the road was quite extraordinary. Our original road block, about half a mile north of the enemy advanced position, was organized for all-around defense and called Perimeter "Huggins," after Capt. Meredith M. Huggins of I Company, 126th Infantry. Immediately north of Huggins was a second Japanese defensive position, and just beyond this a second Allied road block later called "Fisk," after Lt. Harold R. Fisk of the 163d. Less than a quarter mile farther north was a third group of enemy defenses. Our supply line to the road blocks ran through dense jungle east of the road and had to be patrolled constantly. At three points along it we maintained small defensive positions. Perimeter Huggins was on relatively dry, jungle-covered ground, some 4 feet above the swamps on either side. An outer ring of rifle and automatic weapon positions extended about 250 yards from north to south and 150 from east to west. Each position was about 15 yards from its neighbors and consisted of fox holes for a squad. The fox holes were arranged in square or circular patterns. Between this and the inner or support perimeter were small supply dumps, kitchens, and lower headquarters. The inner perimeter, similar in plan to the outer, contained higher headquarters, switchboard, 81-mm mortars, ammunition dump, and aid station. Slit trenches were everywhere and the whole area was often densely crowded, especially when troops were in transit to other points. Our other road blocks were, like Huggins, perimeters organized for all-around defense. When the 163d took over Perimeter Huggins from the Australian 39th and 49th Infantry Battalions and the Australian 2/7 Cavalry, Japanese tree snipers were very troublesome but were soon thinned out and forced back by harassing mortar fire, by special antisniper patrols, and by our own tree snipers. At night our men were not permitted to move from their slit trenches and those in the front line used hand grenades against suspicious noises. Huggins was our main position and headquarters of the regiment. Fisk consisted of two smaller perimeters, one on each side of the road. The enemy used no artillery or planes and his defenses were in such dense jungle that fear of casualties among his own men from tree bursts prevented effective use of his 40-mm mortars. Consequently, we had to deal only with small-arms fire and grenades. 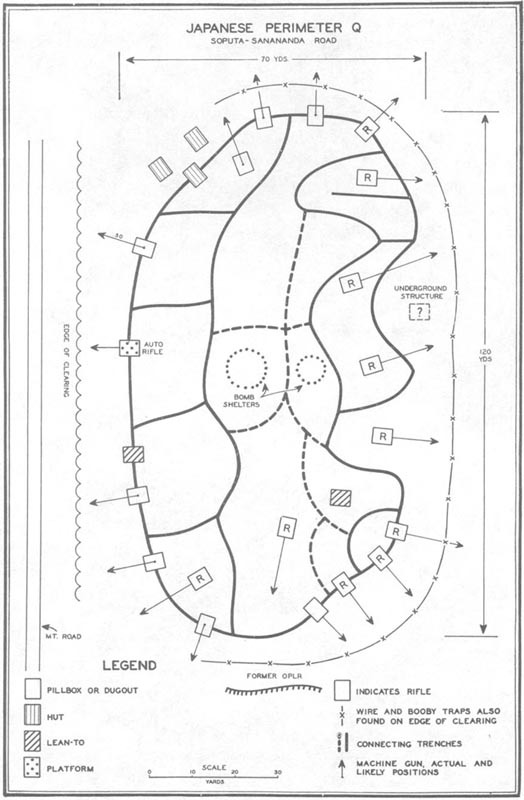 The Japanese defenses consisted of groups of bunkers arranged about 5 yards apart in circular or oval patterns on both sides of the road.9 Automatic weapons were sited to fire 6 to 8 inches above the ground and along fire lanes so carefully cleared that little disturbance of the jungle was apparent. Around the perimeters were trip wires and vines attached to warning rattles. Enemy patrols and snipers were active on all sides. During the 7 weeks of stalemate preceding the arrival of the 163d Regiment, American and Australian patrols had discovered that there were several Japanese defensive positions along the Soputa-Sanananda Road, but no clear understanding of their nature or extent had been gained. Between 4 and 7 January, patrols found that just north of Huggins there were two enemy perimeters: "Q" on the west and "R" on the east of the road. At noon on the 8th, after a 15-minute preparation by artillery, mortars, and machine guns, B and C Companies attacked Perimeter "R." C Company attacked southward from the supply trail leading to Fisk but was stopped in front of "R" by a swamp which was more than waist deep as the result of heavy rain during the preceding night. B Company advanced northward from Huggins but had made only some 20 yards when it came under heavy cross fire. Here it dug in, about half way between Huggins and "R."
9. A typical perimeter, known as "Q," which was on the west side of the road between Huggins and Fisk, is illustrated in Sketch No. 5, p. 71. The 2d Battalion had now come up and was bivouacked on the supply trail south of Huggins (Map No. 7, below). On the morning of the 9th, it was sent through Huggins a half mile due west to the Killerton trail, where it established under fire a road block cutting the enemy supply line to his advanced positions. This road block was called Perimeter "Rankin," after Capt. Pinkney R. Rankin of the 163d. The 2d Battalion's move was the first phase of a divisional plan of attack which was to employ both the 163d Regiment and the Australian 18th Brigade, now ready to advance. This plan directed the 163d to hold both possible lines of enemy retreat while the 18th Brigade was breaking through the southernmost Japanese defenses at "P." The 18th Brigade was then to drive up the Killerton trail to the sea and swing eastward along the coast to envelop the entire Sanananda defensive position. The 163d was at the same time to reduce the remaining enemy defenses along the Soputa-Sanananda Road. Meanwhile, in the coastal area, the steady advance of the 1st Battalion of the 127th had been held up for a day by the Konombi Creek. In the early hours of the 10th, assault boats used in an attempted crossing had been swept out to sea by the swift current. That afternoon five men of C Company swam across the stream under enemy fire and rigged a guy wire which enabled the rest of the company, followed by A and B Companies, to cross in boats. By sundown, a bridgehead 200 yards deep had been established. The part of the 127th in the general plan of attack was to press northward through Giruwa Village and establish contact with the 18th Brigade. During the next 3 days patrols from Higgins were active. On the 10th Perimeter "Q" was discovered to have been evacuated and was at once occupied by A Company, which sent out tree snipers and patrols to harass the enemy and feel out the contour of the Perimeter "R," now open to attack from all- sides. The 3d Battalion of the 163d was coming up along the supply trail. 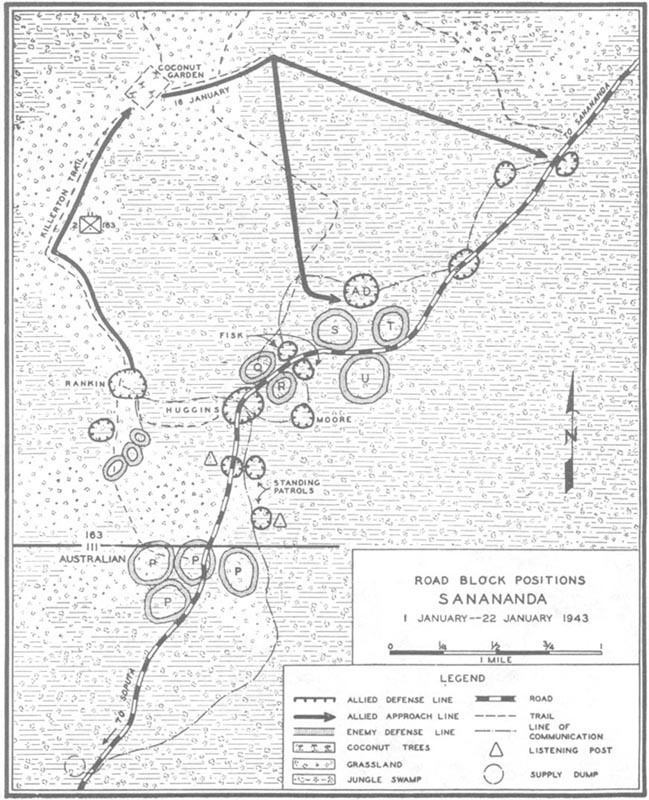 The Japanese could be heard and sometimes seen at work strengthening "R."
The 18th Brigade attacked northward on both sides of the road against "P" on 12 January, with the 163d providing diversions in the form of mortar fire directed against "R" and against enemy defenses on the Killerton trail south of Rankin. The Australians, aided by four light tanks, jumped off at 0800 after 15 minutes of concentrated artillery preparation. K Company of the 163d, operating southward from Huggins, covered the Australians' right flank. By noon it was evident that the attack had failed. Three of the four tanks, which attacked along the road, were out of action. One struck a land mine, one was stopped by two hits from an enemy 6-pounder gun, and the third bogged down when it turned off the road. During the afternoon, patrols from Huggins were sent at the request of the Australians to determine how far north the Japanese position extended. Soon after daybreak on the 14th, a patrol of the 163d picked up a very sick enemy soldier in the bushes along the road just south of Huggins. Hustled to Australian 7th Division Headquarters for interrogation, the prisoner revealed that orders had been received on the night of the 12th-13th for able-bodied troops to evacuate "P," the southernmost Japanese position, leaving behind the sick and wounded. He had tried to follow, but was so weakened by malaria and dysentery that he could not keep up. Acting on this information, the division ordered the 163d to send all available units southward to block escape routes but not to attack. K Company had remained just east of the road since the 12th, and B Company was sent from Huggins down the west side. These 2 companies moved south astride the road, and on the Killerton trail E and G Companies, after 100 rounds from the artillery and 200 from their 81-mm mortars, also moved southward. Nearly 100 Japanese were killed by this bombardment and by the infantry when it followed up. Meanwhile, the 18th Brigade renewed its attack and completely broke enemy resistance south of Huggins. For more than a mile north of its junction with the Soputa-Sanananda Road the Killerton trail was open. The first phase of the divisional plan of attack was now completed. At 0730 on the morning of the 15th, a platoon of A Company, attacking from "Q," managed to get inside Perimeter "R" from the north without being detected. The rest of the company was at once pushed in. C Company, operating from Fisk, sent a platoon to press from the east. B, E, G, and K Companies were now released by the 7th Division from their southward movement and B was sent to the west side of "R" to complete the encirclement. Bunker after bunker was taken in attacks by small groups of our men using grenades, rifles, and submachine guns, but the entire perimeter was not captured until the following day. Shortly before noon, General Vasey came to Huggins and explained the plan for a second phase of the attack to begin next day. talion, was to attack west of the road, enveloping Japanese positions known to be located north of Fisk. Two troops of Australian 25-pounders and two tanks were assigned to support the regiment and fifteen 81-mm. mortars were massed in Huggins. when the 127th was ordered to attack as part of the general plan of the 7th Division. In preparation for the attack on the Soputa-Sanananda Road, A, B, and C Companies of the 163d, which had been squeezing "R," were relieved late in the afternoon on the 15th by I, K, and L Companies. During the night of the 15th-16th, the enemy north of Huggins was harassed by artillery fire. Then from 0845 until the jump-off at 0900, the artillery and mortars provided a heavy preparation while machine guns combed the trees and brush to the northwest of Fisk, where A, B, and C Companies were to advance around the right flank of the enemy positions and effect a junction with the 2d Battalion on the road. 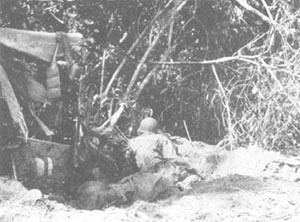 Soon after the jump-off, A Company on the right was pinned down by machine-gun fire from a Japanese perimeter at "S," but C Company, on the left, followed by B Company, met almost no opposition as it swung around to the road. Here at "AD" a perimeter bivouac was established. Company A, which had 20 heat-exhaustion casualties, was then withdrawn and sent to join B and C in the new perimeter. The two tanks, held in reserve for an emergency, were not used. Meanwhile, the Australian 18th Brigade had advanced up the Killerton trail through the 2d Battalion of the 163d, which was now on its way eastward from the Coconut Garden toward the road. After some 800 yards, the trail followed by the 2d Battalion petered out and the troops began chopping their way through the jungle on a compass course aimed at the 1st Battalion objective. F and G Companies came out on the road just south of "AD" and were guided into the bivouac by a patrol from B Company. Part of H Company was left near the Coconut Garden to guard a trail junction, but the rest of the battalion chopped its way eastward to the road a mile north of "AD," where it made contact with patrols of the 18th Brigade's 2/12 Battalion, which had moved eastward from Cape Killerton along trails roughly parallel to the coast. The 2d Battalion had encountered numerous small parties of the enemy and killed over a hundred. liquidated. To the north the attack was making rapid progress. By evening of 16 January, the 18th Brigade, carrying out its wide envelopment, had pushed the 2/9 Battalion into the Sanananda perimeter. The 2/10 Battalion was left to face a stubborn enemy group on the coast west of the bay, while the 2/12 Battalion, advancing on the right flank, was on the road about a mile from the coast and in contact with the 2d Battalion of the 163d. On the coast, the 1st Battalion of the 127th attacked at 0800, following a rolling artillery and mortar barrage, but despite reinforcements from the 2d Battalion, made no progress in the face of effective enemy machine-gun fire. Pressure against this flank of the Japanese position was being maintained, to the obvious advantage of our operations elsewhere on the Sanananda front. Any plan which the enemy might have had of an orderly withdrawal along the road to the beach at Sanananda bad been foiled. His remaining forces were split up and under heavy pressure, short of ammunition and starving. The second phase of our attack had come to a successful end. The enemy himself realized that his few isolated strongpoints would soon be liquidated. During the night of 16-17 January, the higher Japanese officers removed their wounded from barges in which they set off to seek safety for themselves. The exact nature of the remaining enemy defenses on the Soputa-Sanananda Road was not yet known, but a considerable force was believed to be between Fisk and Perimeter "AD." On the 17th, B Company probed southward from "AD" until it was stopped by fire from bunkers at "S." On the following day, C Company pushed forward east of B Company to envelop "S" but was stopped by fire from both flanks. Then A and K Companies extended the envelopment still further eastward but ran into another enemy perimeter at "T." F Company, ordered to join the attack on "T," advanced down the road from the north, disposing of 54 Japanese before it was held up by machine-gun fire from the northeastern end of Perimeter "T." About noon the enemy, caught between our, 1st and 3d Battalions, showed their nervousness by opening fire on Fisk without being attacked. Probing of the enemy defenses continued on the 19th, when a platoon of I Company, circling east and north from Fisk, ran into a Japanese perimeter at "U." F Company had by this time bypassed "T" and fought its way southward along the road to the north side of Perimeter "U." Reconnaissance in force had now explored the ground between our two main positions, and the general outlines of the three main enemy perimeters were known. Preparations were made for an attack on the 20th, intended to overrun the three perimeters from south to north, beginning with "U." Just after noon, the 25-pounders fired 250 rounds on the target area while the mortars in Huggins fired 750 rounds, and the machine guns of M Company from Fisk combed the trees and brush. Just as this preparation ended and I Company was poised to rush forward from the south, a mortar short killed Capt. Duncan V. Dupree and 1st Sgt. James W. Boland, while a sniper got one of the platoon leaders. The company hesitated for a moment, then went in to attack, but the effect of the bombardment was lost. The enemy had slipped out of his bunkers into firing positions and our attack was stopped. Next morning at 1035, A and K Companies followed closely a perfectly timed concentration of artillery, mortar, and machine-gun fire into Perimeter "T," breaching the defenses and fanning out inside. This softened the resistance in front of B and C Companies which were facing "S," and all 4 companies were able to sweep south to the road by 1120, mopping up both "S" and "T." Our shell fire killed many Japanese and kept the rest inside their bunkers until our infantry were close enough to throw grenades into the firing slits and entrances or shoot down survivors as they crawled out like rats from a hole. After this attack 525 enemy dead were counted. Many showed evidence of starvation and disease. Outposts were placed along the road and most of our troops returned to Perimeter "AD" for supplies and rest. Just before daybreak on the 22d, 31 Japanese, the remnant of 500 fresh troops landed 10 days earlier near Giruwa, were killed in front K Company's bivouac on the road. A lone prisoner reported that some 200 of this outfit had been lost through battle casualties near Sanananda and through disease; a group sent to reinforce the defenders of the road positions had arrived too late; he and his companions had been trying to escape westward. At 1047, I and L Companies attacked "U" from the south, moving in with the last mortar salvo of a heavy bombardment. They found the resistance weak and by 1300 made contact with E Company, which had replaced F Company on the east side of the perimeter. We had 1 man killed and 1 wounded, whereas 69 Japanese were killed by our infantry and many more by our artillery and mortars. Enemy fleeing northward were picked off by our patrols, and general mopping-up continued through the 23d. A Fox Hole on Giruwa Beach. Men of the 127th Infantry holding a position reached on 20 January. in the afternoon a large Japanese hospital area was discovered 300 yards inland. Prisoners stated that some 2,000 casualties of the retreat over the Owen Stanley Mountains had been there late in November, but all save 200 had died from lack of medical care or from starvation. On 22 January, the 127th completed the mopping-up. By that evening 46 prisoners had been evacuated to Buna; a total of 69 were taken in the Giruwa area. The Japanese defenders of Sanananda, like those at Buna, had been destroyed. The Buna-Sanananda operation was ended.